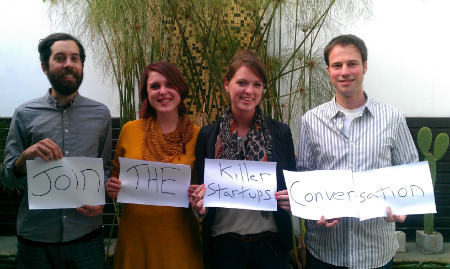 Over here in the top-secret KillerStartups headquarters, we’re all about the people behind the startups. Nothing gets us pumped like a cool founder, a good story, and helping the future Mark Zuckerbergs and Eric Ries’ of the world get off the ground. We’re firm believers that internet entrepreneurship is the way of the future and we want to help you be a part of it. With that in mind, we want to know what YOU want to see more of. We know you like our founder profiles and how-to articles, but it’s time to shake things up! We’ve got an awesome community of motivated, interesting people here and it’s time this conversation turned into a dialogue. So… What’s good, guys? We’ve got a few ideas for ways to make the site even more awesome. Check them out below! 1. Show us what you got! We know you have that elevator pitch down to a science, because you’re obviously a rockstar. Send us a video of your best one minute pitch about why your product or site is the greatest thing since Google. We’ll post the best elevator pitches on KillerStartups and ask our readers to vote on which one’s best. The winner gets an in-depth profile on our website (along with great exposure). 2. Let’s make a deal. Does your company have an awesome promo or coupon that you’re offering? Want to spread the word? Send it our way and we’ll do a quick piece on it, getting it out to a community of people who are pretty much guaranteed to be interested. One the same note, if you’re in beta and want to offer some special invites to people who know how to look critically at an internet startup, we’d be glad to offer them to our readership. 3. Hey Girl. One look from you is worth 10,000 page views. I have no doubt that you guys are Facebook-bombing all of your coworkers who are forgetful enough to leave their profiles open when they’re not at their desks. Also, random funny stuff happens all the time in the startup world and we want to spread the laughter. Send us your homemade memes of your coworkers, famous startup entrepreneurs, or any funny situations you’ve had to deal with. Everyone likes a funny little break during the day, right? 4. We want to be your new hookup site. I don’t know why one site hasn’t become the Monster.com of startups yet (Great idea guys! You paying attention? Get on it!) but it hasn’t quite happened. While our ambitions aren’t that high, we would like to help connect you with talented people. If you’re looking to expand your team, you could send us your job postings for us to share with our readers. 5. Office Spaces and Team Mascots. Want to see what other startup office spaces look like? Love photos of entrepreneur’s pets? Want to see pictures of other startup founders partying hard and dancing the night away? So do we! You could send us photos of your office, team, pets, and party time for a fun, feel-good, behind-the-scenes photo-break look at the people (and pets) behind the statups. What would you like to see us do? #1? #3? All of the above? Let us know in the comments section below and feel free to suggest some additional rocking ideas of your own!